Zadanie „ Wdrożenie platformy Open Journal System dla czasopisma „Bulletin of the Section of Logic” finansowane w ramach umowy nr 948/P-DUN/2016 ze środków Ministra Nauki i Szkolnictwa Wyższego przeznaczonych na działalność upowszechniającą naukę. 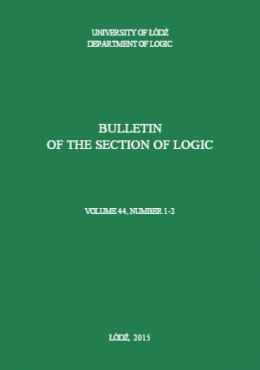 The Bulletin of the Section of Logic (BSL) is a quarterly peer-reviewed journal published with the support of the Lodz University Press. The BSL was founded in 1972 by Ryszard Wójcicki, Head of the Section of Logic of the Polish Academy of Sciences, then based in Wrocław, as a newsletter-journal designed for the exchange of scientific results among members of the Section with their national and international partners and colleagues. The aim of the Bulletin is to act as a forum for the prompt wide dissemination of original, significant results in logic through rapid publication. The BSL welcomes especially contributions dealing directly with logical calculi, their methodology, application and algebraic interpretations. „Bulletin of the Section of Logic” jest kwartalnikiem naukowym publikowanym we współpracy z Wydawnictwem Uniwersytetu Łódzkiego. Został on założony w 1972 roku przez Ryszarda Wójcickiego, szefa sekcji logiki Polskiej Akademii Nauk, jako biuletyn poświęcony wymianie wyników prac badawczych członków sekcji z ich współpracownikami i partnerami z innych ośrodków: w Polsce i na świecie. Czasopismo stanowi forum służące rozpowszechnianiu wyników najnowszych i najbardziej znaczących badań w krótkiej i zwięzłej formie. „Bulletin of the Section of Logic” zaprasza do współpracy autorów zajmujących się kalkulacjami logicznymi, ich metodologią, zastosowaniami i interpretacjami algebraicznymi. The review process is arranged by a double blind system. Every text is subject to at least two reviews. Manuscripts can be submitted to the Editor-in-Chief or any member of the Editorial Board. The BSL prefers submissions in standard LaTex, Tex, or AMS-LaTex (BSL-style). For the purpose of refereeing, papers may be submitted either in hard copy (a CD-ROM with the .tex version of the paper should also be included) or via e-mail. Prospective authors should follow the layout of published BSL papers in the preparation of their manuscripts. Every paper must include an abstract whose electronic version will be used in BSL_ON_LINE. Authors who are unable to comply with these requirements should contact the Editorial Office in advance. Paper Length should not exceed 18 pages when typesetted in LaTex with the following parameters: 12 pt bookstyle, textheight 552.4 pt, textwidth 5 in. In exceptional cases an Editor can accept and subsequently recommend a longer paper for publication if the significance and/or the presentation of the paper warrants additional space. Footnotes should be avoided as much as possible. When essential, they should be brief and consecutively numbered throughout, with superscript Arabic numbers. L. Henkin, Some remarks on infinitely long formulas, Proceedings of the Symposium on Foundations of Mathematics: Infinitistic Methods, Warsaw, 1959, Pergamon Press, New-York, and PWN, Warsaw (1961), pp. 167-183. S.C. Kleene, Mathematical Logic, John Wiley & Sons, Inc., New York (1967). J. Los and R. Suszko, Remarks on sentential logic, Indagationes Mathematicae, 20 (1958), pp. 177-183. Both the affiliation and mailing addresses of all the authors should be placed at the end of the paper. When submitting an extended abstract of a paper to the BSL, the author(s) should provide complete bibliographical information about the full paper. It is the author’s responsibility to obtain the necessary copyright permission from the copyright owner(s) of the submitted paper or extended abstract to publish the submitted material in the BSL. Editorial Office of BSL is hosted by the Department of Logic, University of Lodz, Kopcinskiego 16/18, 90-232 Lodz, Poland, +48 42 6784488.